Limited Time Offer: Click here and sign up for DentalPlans.com using coupon code MONEYCRASHERS to get 10% off any plan and 1 month extra free. How often do you go to the dentist or eye doctor? If you’re like me, probably not often enough. Sometimes, though, whether you simply need a routine checkup or a more serious issue demands treatment, you’ve got to get your teeth and eyes examined by a professional. :DentalPlans – note the clever sideways grin – may be able to make those periodic trips more affordable. The company connects you with about 40 providers of dental savings plans and a handful of more comprehensive savings plans – also known as multi-benefit, or simply “other” plans – for visits to the optometrist, hearing care provider, chiropractor, and pharmacy. Depending on their terms, these plans may provide discounts on cleanings, eye and hearing exams, prescriptions, and certain procedures, such as tonsillectomies. It’s important to note that these plans aren’t dental insurance. Instead, :DentalPlans offers discounted rates (typical discounts range from 10% to 60% of full cost) on specific services at participating providers. Each plan comes with an annual membership fee that can range from less than $30 to nearly $200, depending on location, services covered, and participating providers. Another key distinction: These products don’t count as qualified plans under the Affordable Care Act. You should also know that your current provider may not accept some plans – before opening one up, be sure to search for a participating practice in your area. While :DentalPlans does have a few multi-benefit savings plan options, which combine savings on dental work, eye care, prescriptions, and other services, there are far more dental-only savings plans. Accordingly, it may be harder to find a participating optometrist, audiologist, chiropractor, or pharmacy near you. You can search for and purchase dental plans and multi-benefit plans (which include vision, chiropractic, prescription, hearing, and other services) for individuals or families. These plans vary by state, so your options may differ from other locations. You purchase and pay through :DentalPlans, but plans are actually administered by their issuers. Participating issuers include recognizable companies like Aetna, Blue Cross Blue Shield, and Delta Dental, as well as smaller companies such as QualiDent, UniCare, and Amacore Dental. :DentalPlans claims to have more than 100,000 participating dentists and a smaller but unspecified number of other providers in its network. One major difference between these plans and traditional insurance plans: You must pay the annual membership fee upfront. Unlike insurance plans, which allow you to pay monthly premiums, there’s no monthly billing option on any products offered through :DentalPlans. Like a traditional insurance policy, your savings plan comes with a membership card and unique ID that entitles you to preset discounts on services and procedures. To ensure that your plan is accepted, you should offer up your membership ID when establishing a relationship with a provider. For billing purposes, you also need to show your card when you leave the office after a visit. Unlike a regular insurance policy, your savings plan doesn’t come with a copay, coinsurance, or other expenses. You simply pay a discounted rate for the services you receive. You can’t use your savings plan in conjunction with any other insurance or savings plan, though you may use it to offset costs that exceed your dental insurance plan’s annual coverage cap. For each dental savings plan, you pay an annual membership fee that ranges from about $80 to $180 for an individual and about $110 to $280 for a family. Fees for other savings plans, such as vision and chiropractic, range from $30 to $50 for individuals and $50 to $80 for families. Unless otherwise stated, all plans activate three calendar days after you purchase them. They automatically renew each year unless you choose the “Do Not Renew” setting on your account dashboard. For all plans, the fee entitles you to savings of 10% to 60% on the cost of an office visit or procedure – the exact discount depends on the specific plan and what you’re paying for. To arrive at the discount, the plan sets a maximum cost for each service, procedure, or prescription. For instance, a multi-benefit plan offered by Bonus Benefits caps the cost of an in-ear hearing aid at $670, compared to a nationwide average cost of $873. A dental-only savings plan offered by CVS Caremark caps the cost of a routine dental checkup at $24, compared to a nationwide average of $57. Dental Plan Search Feature. Specifically for dental savings plans, :DentalPlans offers two different ways to search for a suitable product: by provider and by procedure. For providers, you can do a broad search that requires just your ZIP code, a particular type of dentist (such as orthodontist or periodontist), or the name of your preferred dentist, to see which (if any) plans are accepted. With the procedure search, you can select up to five services or procedures (such as braces, root canals, and gum treatments) and input your ZIP code to find plans in your area. The procedure search feature is particularly useful if you don’t have time to wade through the restrictions and fine print for each plan. There’s no search tool for non-dental plans because there just aren’t that many. Auto-pay. When you sign up for a savings plan, you need to provide a credit card. You’re automatically enrolled in auto-pay, which charges your plan’s fee to your stored card on your annual renewal date. You can opt out of auto-pay at any time. Live Customer Service Representatives. :DentalPlans makes human employees available by phone and online chat between 8am and 9pm EST Monday through Friday, 9am to 6pm on Saturday, and 10am to 5pm on Sunday. Discounts and Sales. To sweeten the deal for new customers, :DentalPlans may also offer temporary discounts and sales. For instance, its Labor Day 2014 sale offered three months free and 10% off the remaining annual fee for any plan purchased over the weekend. Cancellation Policy. :DentalPlans has a no-questions-asked cancellation policy for the first 30 days of your plan enrollment. To cancel, call into customer service with your member ID. Full refund of your annual membership fee – which you pay upfront – typically comes within 30 days after you make the call. If you want to cancel after 30 days, you can do so as well. However, to receive a prorated refund, you must meet certain criteria, such as being unable to find a participating provider within 25 miles of your home (50 miles in rural areas) or not receiving your plan’s promised savings from a provider that claims to participate. Services for Providers. :DentalPlans definitely caters to patients, but the company does offer some perks to entice providers to accept its savings plans. For instance, it offers marketing support in the form of banner ads, landing pages, postcards, mailed brochures, and automated emails. It also sends a monthly newsletter with industry happenings and promotional tips. And, for a fee (which is not disclosed publicly), providers can advertise on :DentalPlans’ website. Eliminates the Need to Search Multiple Websites for Dental Savings Plans. You can buy savings plans directly from companies such as Aetna, QualiDent, and Cigna. However, :DentalPlans’ centralized database eliminates the need to navigate multiple websites when comparing your options. Payment May Be Less Complicated Than Insurance. Unlike traditional insurance, a savings plan purchased through :DentalPlans doesn’t require you to keep track of copayments, coinsurance, annual benefit maximums, and other fees and restrictions. You only have to worry about paying your membership fee and a discounted, flat rate for each service used. Frequent Sales and Promotions. :DentalPlans regularly offers attractive sales on its plans, such as three months free plus an additional 10% off. These promotions may not be available when you buy a savings plan directly from its issuer, so they could be critical to your decision to use :DentalPlans in the first place. Discounts Aren’t Capped. Many traditional dental and vision insurance plans have an annual maximum benefit. If you exceed this limit, you may have to pay for all additional services out-of-pocket for the remainder of the year. :DentalPlans’ offerings do not impose this restriction, so you can visit your providers as often as you like without worrying about losing your discount. Coverage May Be Spottier Than Traditional Insurance. There’s no guarantee that your provider will honor the discounts promised by a particular savings plan. Some might not accept any savings plans at all. If you’re used to visiting a certain dentist, optometrist, or other professional, check to see if they accept your preferred :DentalPlans savings plan. For instance, Dr. Sharon Song, a dentist in Norwalk, Connecticut, accepts traditional dental insurance plans from eight different insurers, but only three dental savings plans. You Can Only Cancel Within 30 Days of Enrollment or Renewal. If you want to cancel the dental savings plan you purchased through :DentalPlans, you should do so within 30 days of your enrollment or automatic renewal. This is because :DentalPlans’ cancellation policy overrides those offered by the actual underwriters of a plan. After 30 days, :DentalPlans’ cancellation requirements become very strict. Dental Savings Plans Aren’t Employee Benefits. Unlike dental insurance plans offered through your employer, what you pay :DentalPlans can’t be deducted from your income with pretax dollars. This may reduce its value relative to traditional, employer-sponsored dental plans. Advertised Savings Are Based on National Average Costs. 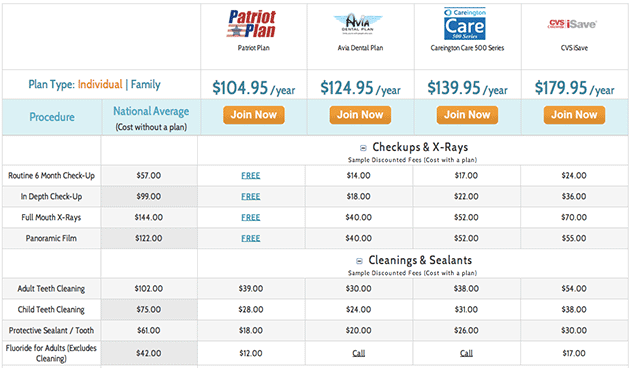 :DentalPlans uses nationwide average costs to calculate the advertised savings for covered services. In the fine print, it advises that your savings may be significantly different from these headline figures. If you want to find reliable costs for services and procedures in your area and figure out exactly what you’d save, you need to do your own research. No Details or Reviews for Providers. When you search for a dentist, you’re given a list of relevant practitioners and the plans they accept. However, beyond their contact information, specialty, and cost for services under each plan, you don’t get much useful information. An outside provider search and listing service, such as ZocDoc, is necessary for detailed information, including reviews. No Option to Pay Monthly. :DentalPlans doesn’t give you the option to pay your membership fee on a monthly basis. You have to pay the entire annual fee upfront when you enroll in the plan, which could be a significant financial hurdle if you’re living on a tight budget. By contrast, regular insurance companies allow you to pay monthly premiums on dental plans and other types of policies. :DentalPlans offers a straightforward way to get affordable dental care and other services from thousands of providers without purchasing a traditional insurance policy. However, it’s worth remembering that these plans are not actually insurance. Before you choose one over an insurance policy, you need to take a hard look at your healthcare needs and determine which product would better serve you. After all, your oral health – and possibly the health of your eyes, ears, and other body parts, too – sits in the balance. :DentalPlans connects you with dental and multi-benefit savings plans that can simplify the process of paying for certain services and procedures. It also eliminates the need to pay monthly premiums and it doesn’t cap benefits. However, its plans may not be accepted as widely as insurance. In addition, you may have to do your own research to tease out your chosen plan’s true savings. 3.9 out of 5 stars: A useful, convenient resource for those who can’t or don’t want to get insurance through their employers. It would be nice if there was more information about providers and true costs on-site. How do you pay for visits to your healthcare providers?